We've all seen blogs that display a blogger's recent Twitter activity. This widget takes social network sharing to another level. SocialFeed allows you to share not just your Tweets but also your activity on Delicious, Facebook, Flickr, LastFM, Pownce, StumbleUpon, YouTube, Digg, and Vimeo. You don't even have to type in your passwords (hooray!). 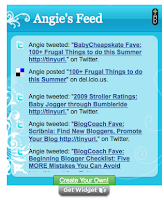 This is a great widget for those of you with "personal" or "family" blogs. Choose from several different widget styles. You can control the height and width of the widget as well as how many feed items are displayed. Format the widget by typing in your usernames. Then copy and paste the script into your template, or simply click to have the widget added to your Blogger, TypePad, or WordPress blog.